I’ll admit it. I have a hard time getting excited about Leonard Slatkin. In my mind he’s in that Robert Spano category, someone who seems to have all the attributes and interests you would want in a conductor, but somehow missing that excitement factor. Maybe it’s my own bias against all things quintessentially American, and maybe its just that familiarity breeds contempt. But I will say, with shows like this weekend’s LA Philharmonic program, I might just change my mind. The program was a jumble of unrelated works, all played with real commitment and attention. After Tchaikovsky’s Romeo and Juliet overture – a likely sop to audience members who must have one piece they recognize in every program- came the main course, the Glazunov violin concerto. It’s not much of a concerto, in that the orchestra has virtually nothing to do and the solo writing is dramatic and romantic if not overly flashy. Hilary Hahn was the soloist and it must be said that she spun straw into gold. Hahn wrenched more passion and thought out of this 20-minute piece just by sheer intensity and force of will than I would have thought possible. She’s remarkable, and I hope she wins one of those Grammys next week for her Schoenberg vionlin concerto recording. The second half of the show was completely unrelated to the first. It began with a really good run through of Steven Stucky’s Son et lumière. Slatkin concluded the piece by noting that Stucky and John Adams have become virtually a “household names” at least in musical circles in this town. By way of introduction to the final piece, William Schuman's Symphony No. 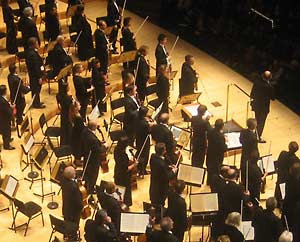 3, Slatkin noted that a prior generation of American composers, including Schuman and the likes of Roger Sessions, are largely fading from American stages despite the important connection between early 20th-century American music and their late 20th-century descendants. Schuman’s Symphony No. 3 was offered here as an introduction to this important time in American classical music. The work, which I was previously unfamiliar with, is not bogged down in folk idioms in the way many composers earlier in the century had been, like Copland. And while there is something "American" about it, I would not describe it as being evocative of particular cultural milleu in the way one thinks of Gershwin. The influence on later generations is also clear, although Schuman, like his contemporaries, was interested in maintaining a European heritage of Symphonic music that has largely gone by the way side in recent decades. 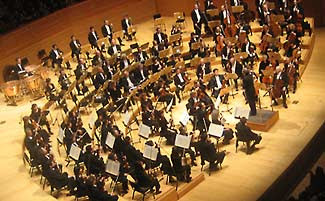 It was a fine performance and well deserved, all thanks to the L.A. Phil and Leonard Slatkin. REDCAT has a very exciting production on stage this weekend from Mexico’s Teatro de Ciertos Habitantes entitled Monsters and Prodigies: The History of the Castrati. The piece premiered in 2000, the brain-child of director Claudio Valdés Kuri and its author Jorge Kuri and has traveled far and wide both in Europe and the Americas, now arriving in Los Angeles four years after the death of its author. It’s a broadly comic and often giddy take on the history of the castrati, the group of young men who typically underwent an orchiectomy in their youth in order to preserve the quality of their high voices, enabling them to appear as heroes and lovers in Baroque operas throughout Europe. The practice continued for several hundred years until the practice fell out of favor at the beginning of the 19th century. A bizarre cast of characters, including the centaur Chiron from Greek mythology, a pair of Siamese twins, a slave, a maestro, a virtuoso castrato, and Napoleon cavort for nearly two hours presenting snippets of historical narrative from this lengthy history, not so much acting out events, but relating them through a series of farcical interactions that include singing, dancing, throwing sand, and horrid costumes like something out of a John Copley-directed operatic nightmare. I don’t want to give too much away, the video clip above may give you more of an idea. The piece is quite funny even if you are not an opera fan, although it probably pushes more than a few buttons if you are and you speak enough Spanish and French to get some of the asides not translated on a screen above the action. But the reason History is great is not just because it’s very funny. At its very heart, it is also deadly serious. The work has something to say about colonialism and class, as well as the way Western culture is as much about destruction as much as it is about beauty and creation. Just as Western art creates the castrati, a sort of monstrosity not unlike the mythical Chiron, for its own amusement, it just as easily rips them down for its own cultural benefit with the arrival of the age of reason. Napoleon himself arrives near the end of the work, and suddenly the beloved “monsters” of opera become despised and reviled for the same qualities that made them so loved and prized in the first place. In History, Western art is not a laurel of salvation like the one our modern day press has crowned the likes of Gustavo Dudamel with – music as a force that washes clean the masses and soothes the soul. This is an art, like the culture it comes from, which also destroys, creating monsters for ones amusement in a bear-baiting like fashion. There is a modern correlate here as well. While we no longer have the surgically-created castrati of Jean Ambroise Paré, opera still engenders the same desire to view its performers as biological machines, jumping through a predetermined series of exercises that are ascribed somehow to the service of beauty. Take for instance the kind of sniping that occurs when vocalists “under-perform” such as arose this very week around the usual blogs in response to the Villazon/Netrebko performance of Lucia di Lammermoor in New York. Opera, and art for that matter, becomes little more than a sport in a context where flawless vocal technique reigns supreme above all else. History is full of broad fun, but at its core is a poignancy and deeper meaning that are easy to overlook. Kuri's play is a clever trick and a wonderful evening. It occurs to me that if one wishes to be treated like an adult, then perhaps it is best to act like one. Or at least this is the cliché on my mind after Tuesday’s second performance from the San Francisco Symphony at Walt Disney Concert Hall in Los Angeles. The hall was filled with a youthful exuberance, which speaks of many unsold seats and a plethora of rush tickets distributed to individuals excited to find another use for their semi-formal garb and all too eager to splash on cologne. Now I’m not one to dive into the whole hackneyed debate over clapping between movements. But let it be said that it was a distinct pleasure to find a group of young adults so profoundly moved by the first two movements of Berg’s Three Pieces for Orchestra that they could not help but express their joy through applause neatly delineating these movements from one another. In fact the excitement was so contagious that they continued this effusive behavior into all the silent spaces between movements of the Brahms’ First Symphony, which followed despite the admonishments of conductor Michael Tilson Thomas. Ah, youth. Of course juvenile behavior may have been in order given that the concert often seemed like more of a class than a concert. MTT gave an extended introductory talk from the stage in the middle of the show on the Berg piece complete with samples played right then and there by the orchestra before actually embarking on the performance. Sometimes, even when you try to avoid the pre-concert lecture, it follows you into the show anyway. I’m not sure if it was this didactic introduction that made the performance sound more like Stravinsky than Berg in the end, but, for me at least, the edges seemed blunted and soft. As for the Brahms, I’m not a big fan so it could have been great for all I know, but I suspect it wasn’t. Copland’s film music from Our Town kicked things off with it’s introspective Americana. So, it wasn’t a completely awful show, but it never seemed to connect for me. But that doesn’t necessarily appear to be the fault of the conductor or the orchestra. They are a fine group of musicians and gave a whiz-bang performance of Mahler’s Sixth just three or so years ago here. It’s a shame that tonight they didn’t get the audience they deserved. For awhile now here at Out West Arts, I’ve kept a Calendar column on the left-hand side listing upcoming events that I’m planning on attending and that I think are worth seeing here and around the country. However, sometimes this list gets lost in the shuffle, so starting this month, I’m going to start featuring monthly upcoming event highlights you may want to check out. Now, these are tough times, but, while I’m aware of competing priorities, it’s still important to support our local arts organizations here in Los Angeles where we’ve got such a world-class variety of music, theater, dance and other live performance events. So, if you’re looking for something to do, here are some things I'd recommend for February. Probably the biggest L.A. event in February will be the opening of Wagner’s Das Rheingold on the 21st, the first installment of L.A. Opera’s Ring Cycle production that will be directed by Achim Freyer. It’s the first public notes of a major multi-year undertaking that will continue to generate a lot of attention on Los Angeles for months to come. The company has circled its wagons to go forward with this, and, with Freyer's track record here in L.A., it's bound to be interesting if nothing else. It’s not the only opera event, though. Musica Angelica will be presenting concert performances of Purcell’s The Fairy Queen on February 14 and 15, and down south, San Diego Opera will open a production of the infrequently-preformed Don Quichotte by Jules Massenet starring Denyce Graves and Ferruccio Furlanetto on February 14 for 4 performances. UCLA Live will kick its spring season into gear with two big dance events. The renowned Guillermina Quiroga Dance Company (pictured above) will appear at Royce Hall on Feb 4 and 5 in their first North American Tour with a program of Tango, following sold-out performances in New York in 2006. 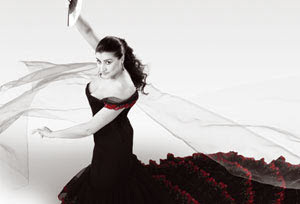 Then, just a few days into March on the 3rd and 4th, family Flamenco legends Los Farruco will also appear on the Royce stage. There are also visits from playwright Edward Albee on the 7th and the Munich Symphony Orchestra on February 21st. There are plenty of other music events of note as well. Danielle de Niese will give a recital at the recently-opened Broad Stage in Santa Monica on the 10th and Rod Gilfry will return to Los Angeles there on March 1. Beautiful and illustrious soprano Cecilia Bartoli returns to Southern California at the Segerstrom Concert Hall on the 14th on her tour to support her superb Grammy-nominated recording Maria. Segerstrom will also host German violin virtuoso Julia Fischer on the 12th and Les Violins du Roy in a Baroque program on the 20th. The L.A. Philharmonic season continues with appearances from Christian Zacharias on the 22nd, and James Conlon will take a break from his Wagner duties across the street for a Mendelssohn program on the 26th. But wait there’s more! REDCAT will host a rare West Coast appearance from New York's The Necks on Feb 19, and Japanese puppet masters, the Awaji Puppet Theater Company on the 18th. 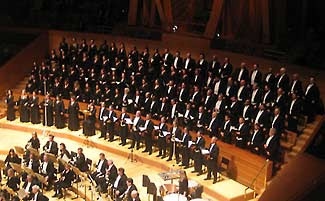 The LA Master Chorale will perform works of Pärt and Nico Muhly on the 22nd, and Kevin Bowyer will pair organ works of Pärt with those of Bach on Feb 1 at the WDCH. New music will take center stage when Monday Evening Concerts looks at the work of Gérard Griesy on the 16th and L.A.'s own Vicki Ray will give a recital featuring John Adams and Rzewski in Zipper Concert Hall on Feb 3rd. Theater wise, the Ahmanson will premiere a new musical, Minsky’s from the creators of The Drowsy Chaperone and Annie that opens on February 6 while performances of Pippin will continue next door at the Mark Taper Forum. The Geffen Playhouse in Westwood will also premiere a new play from Donald Margulies, Time Stands Still to open mid-month. In L.A.'s wonderful smaller venues, I'm looking forward to The Blank Theater in Hollywood's west coast premiere of the musical The Jazz Age, and Boston Court Theater's new staging of Molière's Tartuffe, which will open on the 21st. With all of this activity, somewhere I’m going to find some time to go out of town to Chicago to catch up on the Lyric Opera of Chicago's performances of Tristan und Isolde, starring Deborah Voigt and Clifton Forbis, and the opening of their revival of Cavalleria Rusticana and Pagliacci with an all star cast including Vladimir Galouzine, Ana Maria Martinez, and Guang Yang. I’m also going to squeeze in the Goodman Theater’s new revival of Eugene O’Neill’s Desire Under the Elms, directed by Robert Falls and starring with Brian Dennehy, as well. I think those are the highlights, so help yourself and check out the links above. The Los Angeles Master Chorale continued its current season on Sunday with a performance of Mendelssohn’s oratorio Elijah centered around should-be superstar Eric Owens. It was so close to a home run that it pains me to complain about a minor, if significant, problem. Though it’s in English from a Biblical source, there was no text or supertitles available for the audience. (Or at least none that I could find.) And despite some very fine singing, the bottom line is that if you didn’t know the piece already, you were pretty much screwed for the next couple of hours in terms of what was actually going on. It was a very good performance, but it would have been a great one with a text to interpret what was going on. OK. Now that I've got that out of my system, let's move on and talk about the spectacular performance from the members of the Chorale. For a group so associated with more contemporary works, hearing them go full-throttle at a canonical piece like this with so much passion, control, and skill was a thrill. What’s more, the Chorale is finally getting the kind of orchestral support they deserve as the orchestra now is heavily populated with members of the Los Angeles Opera Orchestra. The ties that bind between the Chorale and the Opera apparently grow stronger and stronger now that Grant Gershon, the LAMC’s music director has taken over as chorus master and Assistant Conductor for the LAO. Tonight, at least for the audience, it was a win/win situation as the orchestra actually lived up to the quality of the Chorale for one of the first times in recent memory. The soloists were all of high caliber including Robert MacNeil, Mary Wilson, and Diana Tash. But, of course, the heaviest lifting was provided by Owens, whose booming, regal voice was as majestic at times as it was sensitive at others. He continues to be one of the few vocalists I look forward to hearing due to the consistently excellent quality of his performances. He should be a much bigger star than he is already. Of course, it would have been nice to actually know exactly what he was singing while he was singing it, but I guess that will have to wait for an opera stage somewhere in the future. The 2009 opera season kicked off on a dramatic note Saturday down in San Diego with a revival of Puccini’s Tosca. And as with most arts organizations these days, it seems to be a contest whether more drama is onstage or off given the financial straits many houses now find themselves in—what with greatly reduced endowments, dwindling contributions, and decreasing ticket sales. As if to drive that point home more clearly, the company’s general director of over two decades, Ian Campbell, appeared on stage before the performance to update the festive crowd on just how tight things have gotten and to appeal for the crowd’s support in face of a reduced season of productions in 2010. While this stiff-upper-lip stuff is certainly necessary, it did run the risk of making the show that followed comparatively anti-climactic. But luckily, the show itself was a reasonable evening that was warmly received by a near capacity audience, although it certainly isn't going to set the world, much less anything smaller, on fire. The San Diego production, originally designed by Jean-Pierre Ponnelle and directed here by Andrew Sinclair, is a fairly effective if standard-issue affair that dates back over 30 years. It still works well without being overly dark or cartoonish. 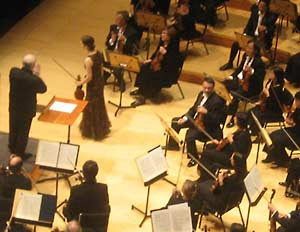 Edoardo Müller was at the podium and the orchestra performed admirably. The Tosca for this run is Sylvie Valayre, who has worked primarily in Europe but is making more U.S. appearances this season. She sings most of the big Puccini gals specializing in Turandot, Butterfly and Tosca. And while her voice is not small, it is a rather blunt instruments that does get the job done despite weakness in the lower range. I was rather thankful she elected to go with more of an ingenue approach to the role as opposed to the “fiery” histrionics favored by too many others. She also eschewed the whole Callas cross and candle preparation of Scarpia’s corpse in Act II, a gesture which frankly has looked tired for almost the entire age of this particular production. Valayre’s Tosca is never quite dangerous, but seemed somewhat more accessible, although her retelling of her murderous actions to Cavaradossi in Act III did produce a few unintended titters from the audience. On the men’s side were two known quantities – Marcus Haddock as Cavaradossi and Greer Grimsley’s Scarpia. Haddock sounded less strained than I’ve heard him recently and he is convincing in a youthful way. Grimsley is probably the strongest vocally in the cast and he is menacing despite having to perform such gestures as removing a periwig in preparation for a planned ravishing. But still, if you like Puccini and live in the area, you could do worse than this Tosca. Or maybe not. With the dwindling opera options in Southern California following the closure of Opera Pacific, San Diego may be one of the best options for those interested in fully-staged fare that don't want to drive up to L.A. San Diego has a number of other interesting productions this winter including a rarity in Massenet's Don Quichotte in February with Ferruccio Furlanetto and Denyce Graves; and Peter Grimes with Anthony Dean Griffey in April following his sensational performance of this role in New York last year. The first programs offered by the Los Angeles Philharmonic this week following a spectacular run of shows over the last two weeks under Esa-Pekka Salonen were a decidedly mixed bag. 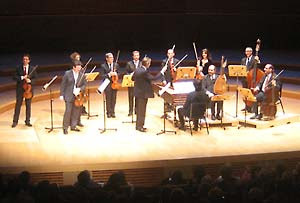 Following Tuesday’s very good Green Umbrella program of contemporary works, Walt Disney Concert Hall was thrown decidedly into reverse with a performance from Giuliano Carmignola and his Venice Baroque Orchestra featuring music from Vivaldi, a decidedly long-deceased composer. However, this, too, was quite a treat. While the group has been here before with largely the same shtick, it doesn’t get old. 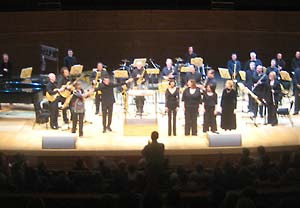 The Venice Baroque Orchestra’s playing remains crisp, dynamic, and well paced. Carmignola never overplays Vivaldi’s hand and lets the music do what it was intended. His solo work in the four violin concertos on the program was also quite admirable with a light enough touch without skimping in the energy department. Speaking of violin soloists, however, Gil Shaham had a much less successful stint in this weekends shows with the Los Angeles Philharmonic under Stéphane Denève. Shaham did the dirty work in the Khachaturian violin concerto with a technically admirable performance that really failed to connect. It wasn’t all his problem, though, in that Denève led one of the most torpid and arduous performances I’ve heard here in awhile. (That is, if you exclude Mr. Dudamel) Let’s put it this way, you know that you are in serious trouble over the course of an evening when you start thinking, “Well, maybe the Rachmaninoff will be better.” It wasn’t. The Syphonic Dances, like the Khachaturian, is one of those later-romantic messes that cries out for someone to step in to temper the histrionics. Instead, Denève plunged head in stretching out every last half-baked idea beyond the breaking point and adding what seemed like hours to a reasonably short program. I’ve come to really enjoy the maestro’s performances in L.A. over the last few years, but this was not one of them. The show also featured Stravinsky’s “Dumbarton Oaks” concerto, a bit of tepid Americana à la Copland that didn’t help matters either. Oh what a relief it is. At least that was my thought earlier today after hearing the announcement for the Los Angeles Philharmonic’s 09/10 Season, the first under new music director Gustavo Dudamel. I've been worried about the fate of new and recent music here at the Disney Concert Hall with Salonen on the way out and the much-hyped Dudamel slowly bronzing in the light of seemingly endless flashbulbs. This anxiety was even more heightened after hearing about the incredible season Alan Gilbert has lined up for the New York Philharmonic next year just days ago. But as far as programming is concerned, all of my worry was for naught. The L.A. Philharmonic is offering up an incredible season with new music around every corner, plenty of old friends, and wonderful and inventive programming throughout the year. So what’s the big deal? Where to begin. Nine world premieres, five of which will be led by Dudamel, including pieces from John Adams, Unsuk Chin, and Stephen Hartke. A major retrospective of works from California composers under the direction of John Adams (“West Coast: Left Coast”) including the likes of Terry Riley and Lou Harrison. A Dudamel organized series “America and the Americas” will revisit works from and inspired by the geographical region to include Osvaldo Golijov’s Pasión Según San Marco, Antonio Estévez’s Cantata Criolla and Kelly O’Connor singing Peter Lieberson’s Neruda Songs. Thomas Adès will return with his violin concerto, Emmanuel Ax will perform in several programs including one with Yo-Yo Ma, and Christine Brewer will give a recital. And while New York may get Ligeti’s Le Grand Macabre in concert, L.A. will have a semi-staged version of the U.S. Premiere of Louis Andriessen’s La Commedia. And did I mention the two appearances from Dawn Upshaw, including her performance of Folk Songs from Berio? There’s plenty more, but I’ll leave that for you to dig out on your own. There’s plenty of bad news these days, and it’s a real pleasure to see something go unquestionably right for a change. Here’s looking to a great first season for Dudamel and another great season for the L.A. Philharmonic. With the last two weeks of programming from the Los Angeles Philharmonic, one would wonder why we need a separate “new music” series at all. With three new commissions and an orchestra generally known for its skill with 20th and 21st century music, a separate weekday series devoted exclusively to these works would almost seem beside the point. Of course, it isn’t though, and the “Green Umbrella” series continues to be the most exciting and worthwhile programming the L.A. Philharmonic does. Tuesday was the latest show in the series with an amalgam of works with little relationship to one another other than their ability to showcase the talents of the various members of the Philharmonic, the respective composers, and assistant conductor Lionel Bringuier who led the evening (sporting a rather fetching new haircut with appropriately hot new head shots to match—this is L.A. after all). The show was mostly dedicated to a performance of Louis Andriessen’s De Stijl, which has graced the Green Umbrella stage once before. It’s a choral work meant to reflect on the work of Piet Mondrian and sets a text consisting of mathematical principles for four vocalists and a small ensemble of pianos, electric guitars, percussion and brass with saxophones and flute thrown in for good measure. This performance followed closely on the heels of Andriessen’s double piano concerto, The Hague Hacking, which premiered over the weekend. De Stijl contains a spoken interlude in which an anecdote about Mondrian is recalled by a narrator and the speaker, Susan Narucki, made the most of Disney Hall by entering from the back with separate lighting and wandering through the crowd for a dramatic entrance. This sort of mixing of dialog, vocal writing and music is key to several of Andriessen's works and again reminded me of his La Comedia which appeared in Amsterdam last summer. De Stijl relies on popular music idioms as much as anything else from the history of Western art music and even when it threatens to break out into full fledged rock, it falls just short, bringing you back to the start. Bringuier led a very enthusiastic and sharp performance of the piece that was serious without being overly dramatic. The first part of the evening was no less interesting, starting with a work from Estonia's other famous living composer Erkki-Sven Tüür. Architectonics III (postmetaminnimalism) was originally commissioned by our own hometown California EAR Unit and proved rather exciting here in the hands of the Philharmonic members who made the most of its loud and upbeat tone. The work shares little with the work of Tüür's countryman Pärt, but actually did have a rather stately and epic quality to it I rather admired. The evening also included Steven Mackey's Ars Moriendi, a string quartet reflecting on the composer's experience surrounding the death of his father. The nine movements of varying length can be discordant at times, less so at others, and had an satisfying way of shifting between impressionistic and literal ideas. It was moving, substantial, and quite well played. 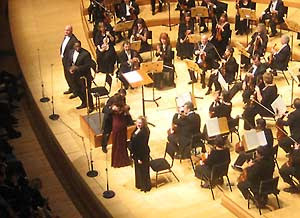 All in all it was another winning night of new music at the Walt Disney Concert Hall. The big question now is, will the lines between the headline weekend programs and the "Green Umbrella" evenings continue to be blurred by the Philharmonic, or will the coming seasons under new music director Gustavo Dudamel stick new music in the ghetto of a handful of Tuesday nights? We should have some of the answers soon when Dudamel appears with L.A. Philharmonic President Deborah Borda on Thursday the 22nd to announce programming for the 09/10 season. If you want to see the cold hard facts for yourself, the press conference will be webcast live at 1:30pm PST. A return visit to L.A. Opera’s current production of Die Zauberflöte was in order this weekend if for no other reason than to take a look at the other very fine cast the company assembled for this run. On the plus side, you had Nathan Gunn’s Papageno which is as unsexy as you can imagine in the bright yellow feathered get up he's forced to wear in this production. I think I rather preferred Marie Arnet’s Pamina to Erin Wall’s last week, but could have done without L’Ubica Vargicova’s Queen of the Night. I have little else new to say on the topic but would reiterate my point from last week that both casts are strong enough, that you could go either way on this one and have a great time. After two false starts Kaija Saariaho’s La Passion de Simone finally arrived on the West Coast this weekend after performances in Vienna, London, and New York. This was supposed to have happened almost two years ago but both scheduling conflicts and health issues of the vocalist Dawn Upshaw forced delays. But now that it has arrived, it was clearly worth the wait. Saariaho’s dark, dense, meditative and urgent work has never sounded as good as it did here in Los Angeles where, at long last, all of the intended players came together at once. Upshaw was riveting in the solo role of a woman contemplating the beauty and tragedy of the life of Simone Weil. Peter Sellars’ minimal staging, which involves a solo dancer, Michael Schumacher, who interacts with Ms. Upshaw in a stark room with nothing more than a door and a writing table and chair was far more effective than the previous incarnation I saw in London. Whether or not this is due to the design of the Disney Concert Hall stage or not, the staged part of this piece was very affecting. But most importantly, Saariaho’s beautiful music finally landed in the hands of the Los Angeles Philharmonic, Los Angeles Master Chorale, and Esa-Pekka Salonen. There is arguably no ensemble more suited for Saariaho's music and these two performances on Thursday and Saturday were gloriously played and sung. Now to be fair, this is not material that is instantly likable. It is dense, non-narrative, often obtusely poetic, and very serious. It's themes of death and particularly a death in the absence of transcendance are not bright and cheery. This is not Die Fledermaus. However, considering the subject matter, Saariaho's composition couldn't be more appropriate. Before she starved herself to death at the age of 34 in an act of solidarity and protest, Simone Weil was many things, but easy and agreeable were never among them. A woman, likely plagued with mental illness, Weil railed against injustice of numerous kinds in ways often highly detrimental to her own health and safety. She was no idiot, graduating at the top of her Paris class only one place above Simone de Beauvoir. Weil’s writings and opinions could be infuriatingly contradictory and Saariaho and librettist Amin Maalouf have captured this sense by using a narrator/protaganist who is not Weil herself but another woman reading and reflecting on Weil’s life from what may be the position of an at times older and at other times younger sister. 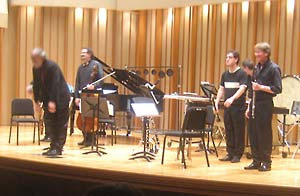 The soloist, Dawn Upshaw, only once speaks any of Weil’s own words although they are often present, spoken by another performer as part of a pre-recorded audio track played back during the piece. Upshaw is magnificent here, as she is just about everywhere she performs, and again finds a kindred spirit in Saariaho. Part of the beauty of La Passion de Simone comes from its sheer density. There is so much going on musically, theatrically, and ideologically in the libretto, that it can feel like one has barely scratched the surface of the work after multiple exposures to the 70-minute piece. There are layers upon layers of music and meaning here to sift through, while the piece flies by. La Passion’s brilliance stems from its demand that you take Simone Weil—a conflicted, difficult woman—seriously for what she has to say even if it isn’t always right or put in a way that is easy to swallow. It challenges the listener to be able to put things aside in order to hear the deeper meaning of a message coming from a place one may not want to go. This was another major achievement for not only Saariaho, but Salonen and the L.A. Philharmonic and considering the size of the audience at both performances (yes, Saturday was a virtual sell out) a testament to the desire to hear new music by audiences in Los Angeles. And we’re in luck, since the show was recorded for release through iTunes, hopefully in the very near future. Friday was yet another remarkable program in two weeks L.A. Philharmonic shows under Esa-Pekka Salonen as he heads into his victory lap here in Los Angeles. It’s going to be hard for him and the group to top this one between now and the end of the season, though it will be fun watching them try. The night started out with Salonen dedicating the evening to the late, great Betty Freeman with the maestro expressing his great love for “the most unsentimental person” he’d ever met. He rightly acknowledged that in terms of her support for a staggering number of commissions (he estimated them at over 400 works), Freeman may well end up being one of the most influential individuals in the history of 20th century music. He could not have offered a more touching tribute with this evening’s performance. It started off with Janacek’s Sinfonietta, which was received with wild enthusiasm for the first piece on the evening's bill. It is a quirky pseudo-symphony that is neither fish nor fowl but five movements of folk-infused energy that features major contributions from an expanded brass section. It was truly lovely and often thrilling. The heart of the show, though, was another big world premiere, this time from Dutch composer Louis Andriessen. 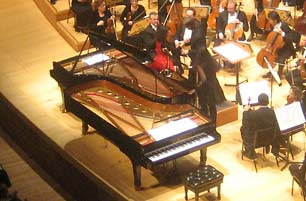 Entitled The Hague Hacking, this single movement double piano concerto performed by Katia and Marielle Labèque, is cut from the same exuberant percussive clear-minded cloth as Andriessen’s most recent works such as La Commedia, which bring to mind Messiaen without the avian overtones. In fact, the work, which is based on a theme from a Tom and Jerry cartoon ("The Cat Concerto") and a popular “sing-along song” about The Hague, is uniquely Andriessen’s. Despite it’s more conventional sources, The Hague Hacking so alters them in form that these melodies disappear at times amongst the volleys between the Labèque sisters. Initially the melodies are expanded as notes are given much slower values than the original, but then later quicken only to be deconstructed within the orchestra. Meanwhile, the Labèques attacked the score with a pixie-like ferocity that seemed both whimsical and deadly serious at the same time. At around 20 minutes it was too short by half and another feather in the the Philharmonic's cap. The evening ended with Salonen’s signature piece, Stravinsky’s The Rite of Spring. Hearing him lead this work is always an event and it has been amazing to watch his approach alter and change over time. It is a testament to Salonen’s genius as a conductor that he seems to bring something new to the table with this work every time I've seen him perform it with the orchestra. Tonight, the piece seemed more infused with a sense of ritual, drawing out the dramatic contrasts and darker elements in favor of the more pastoral ones. It’s sad that this is the last time we’ll hear this work from him as music director here in L.A., but hopefully the many other gifts he’s leaving us will continue to bear fruit in years to come. This excellent program will repeat on Sunday afternoon and on Saturday night, there will be a second performance of Saariaho's La Passion de Simone that I'll have more to say about later. Oh, and one other thing, both this program and the Saariaho are being recorded for release on iTunes where two of the "Shadow of Stalin" programs, featuring the works of Ligeti, Lutoslawski, Husa, and Shostakovich, can be found in fantastic live performances. You should obtain them now. I have been neglecting my duty to mention the very fine program earlier this week from Monday Evening Concerts, which was held, as is their wont, at the Zipper Concert Hall downtown. A great show is standard operating procedure for the MEC folks and this was no exception with a program focused on three American composers born in the 20s and 30s. The players this evening were drawn from yet another remarkable local group committed to 20th and 21st century music, Xtet, which was led by conductor Donald Crockett throughout. Things started off with Morton Feldman’s The Viola in my Life II which featured soloist Kazi Pitelka. It’s hard not to think of this as a sort-of viola concerto. It's actually about as far from a concerto as you can imagine, but it is very much a work of Feldman’s with quiet shifting tones throughout. This is definitely music that , in the words of the late, great Betty Freeman, doesn't tell you how you should feel. Following this was a puckish and impudent work from Alvin Curran, Schtyx from 1992. A response to concerns about the lack of melody in his music, Curran fills Schtyx with all kinds of conventional tunes. The catch is that none of this ever gets very far in a system filled with percussive and disturbing interruptions. A trio of piano, violin, and percussion are assailed by bass drums and cymbals often played by pianist Vicki Ray or violinist Sarah Thornblade. Each of them was armed with their own percussion instrument to alternate with their other primary duties. So what’s a percussionist like David Johnson to do with all the competition? How about scrape a stool across the floor, toss cymbals to the stage floor and drop box fulls of pots and pans in a crashing ramble. I know it sounds noisy, and it can be, but this farcical piece was the highlight of the show and quite witty. After the break, there were two pieces from Frederic Rzewski: 96, an homage to Elliott Carter, and Pocket Symphony, a longer work originally commissioned by eighth blackbird. Both were played quite well, but the more substantial piece, Pocket Symphony, was the more intricate and involving. Played by a small ensemble, the piece is interrupted by six separate solo riffs from various instruments in a fashion not unlike a jazz ensemble. And while these cadenzas never quite reach the level of all-out improvisation, they do allow for the ensemble members to show off their own take on an interesting work. The MEC has a number of strong programs left this year including a solo organ performance from Charlemagne Palestine in March, and they come highly recommended. With so much Wagner coming up this season for Los Angeles Opera, the company wisely decided to start off the year with a little Mozart for warm and fuzzy contrast. This weekend saw the opening of another revival of the company's 1993 Peter Hall production of Die Zauberflöte under the baton of music director James Conlon. In the span of two weeks, the company is doing 9 performances with two different casts with an unusual number of big names and important rising talent across both groups. On Sunday I caught this week's second team, which featured Joseph Kaiser as Tamino, Erin Wall as Pamina, Morris Robinson as Sarastro, Markus Werba as Papageno, and Albina Shagimuratova as Queen of the Night. (The other team includes both Matthew Polenzani and perhaps one of the most beloved Papagenos, Nathan Gunn.) And, in perhaps the most unusual bit of "luxury casting," I've seen in awhile, L.A. Opera has hired Matthias Goerne to sing the part of the speaker. Now I know that L.A. weather has to be better than Germany's as a rule in January, but how the company managed to corral one of the world's premiere Lieder vocalists into appearing for approximately 5 minutes in a role that could just as easily be cut from an opera with more than its share of big hits is beyond me. Don't get me wrong, he's fantastic but I keep feeling there is some gag to this I haven't figured out yet. All this being said, it's remarkable how well this production comes off despite its age. It is a little worn around the edges and not all of the technical issues were resolved on Sunday, but it is still very effective, not to mention fun, colorful, and a little magical. It's not going to change anybody's mind about anything, but in the hands of a very capable cast, this is one revival that really comes alive. Conlon and the orchestra sounded good if rather large and modern for Mozart, but never dull. The cast was quite solid and, despite some ill-fitting costumes, succeeded without any major catastrophes. Joseph Kaiser is a major talent and has played some spectacular supporting roles last year both as Narraboth in Salome at the Metropolitan Opera and Yonas in Kaija Saariaho's Adriana Mater in Santa Fe. As a heavily made-up and brightly costumed Tamino he was noble and charming. Opposite him was Erin Wall whose bright and pretty tone worked well. Albina Shagimuratova handled the coloratura passages of the Queen of the Night with accuracy and strength without any strain or need to have the orchestra slow down, and Markus Werba's Papageno was comic and broad enough to be seen and heard throughout the hall. So, while it may not be new or groundbreaking, Peter Hall's production still has plenty of juice left to impress an audience, and this family-friendly take on Mozart's opera will hopefully be a success for the company this year. Here's the good news, both casts appear to be quite strong, so no matter when you go, you're not likely to go wrong. In the last few seasons the Los Angeles Philharmonic has started the calendar year off very, very strong. Last year we had visiting conductor David Robertson and the “Concrete Frequency” programs, which were both bold in scope and well executed. This year we have two weeks of shows under the leadership of outgoing music director Esa-Pekka Salonen that are heavily weighted with new works from major contemporary composers. Next week are two essential shows, one featuring Kaija Saariaho’s La Passion de Simone with Dawn Upshaw alternating with another featuring Salonen’s trademark version of Le Sacre du Printemps and a world premiere double piano “concerto” from Louis Andriessen written for Katia and Marielle Lebèque. Before all of this excitement, though, was another blockbuster of a show this weekend that was built around another world premiere. Saturday brought legendary Estonian composer Arvo Pärt to Los Angeles for the unveiling of his Symphony No 4, subtitled “Los Angeles.” It’s always thrilling to hear music written by a living composer, but when that composer is of Pärt’s stature, it takes on a special significance. 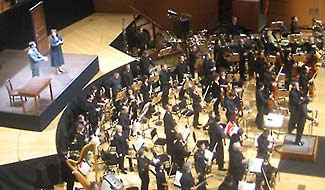 The premiere was also unique in that the score had been published on-line weeks in advance, so Saturday really had the feeling of an unheard music taking its first living breaths in public. And it was spectacular. 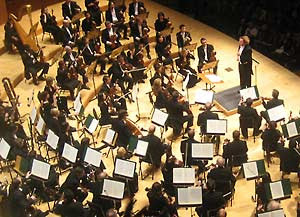 The symphony is undoubtedly a major orchestral work from a composer who is not known for them. That being said, it is scored only for strings, percussion, and harp and runs just over 30 minutes consisting of three movements that are strung together without pause. The irony here is that they are perhaps the only pauses that don’t appear in the work. Pärt continues to be very interested in the silent spaces between the notes, and the orchestra often springs forward only to stop and wait again in silence before beginning again throughout the entire work. The symphony is often very quiet but still filled with the rhythmic and spiritual elements one has come to expect from Pärt. And while the piece never blooms into a full-fledged melody for more than a handful of bars, it is littered with familiar Eastern European folk elements. The beauty of the piece comes not only from its delicacy but its ability to create immense amounts of tension and joy from so few basic building blocks. What does all of this have to do with Los Angeles? Frankly, not much. The subtitle seems to refer solely to the city of its commission; though, in all honesty, LA is a place enigmatic enough that it can be heard here in Pärt’s music. In a program note, Pärt dedicated the work to former oligarch Mikhail Khodorkovsky, the imprisoned Russian businessman who is seen by some in the West as a political prisoner. Pärt casts the Symphony in its own way as a ray of hope and a prayer for freedom which is also easy to hear in the music. Perhaps the most heartening thing for me though was seeing the composer get such an enthusiastic and warm reception from the crowd. He was greeted like a rock star and seeing from the long line awaiting to meet him after the show, he seemed like some 70-year-old Estonian Miley Cyrus. Only in L.A.? Maybe. But whether or not that’s true, tonight was clearly an important one. 1. The Sound and The Fury (April Seventh, 1928) performed by Elevator Repair Service at REDCAT, Los Angeles, 10/08. Not a new production, but new to me and new to LA. The New York-based troupe gave a fully-staged, energetic, and sometimes spooky reading of the first hundred or so pages of Faulkner’s masterpiece. Quirky and over the top, which was the perfect approach for this most gothic of Southern novels. Well worth multiple viewings and another benchmark presentation for the little-theater-that-can downtown. 2. Ivanov by Anton Chekhov performed by the Volksbühne-am-Rosa-Luxemberg-Platz at the Freud Theater, Los Angeles, 12/08. I love Chekhov, and this was a banner year for his work. This return visit from Berlin’s legendary players was welcomed and featured this visually spectacular, funny, and biting approach. Sure it was pretentious, but that is exactly what made it so much fun. 3. 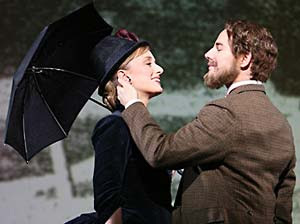 Chekhov's The Seagull at The Walter Kerr Theater, New York 11/08. What was I saying about Chekhov? It sure is easy to love his plays when they are done this well. Another fantastic British import with a superb ensemble cast. Funny and poignant, but never taking itself too seriously. A direct shot to the heart. 4. Laurents and Styne's Gypsy at the St. James Theater, New York, 3/08. It’s is no small feat to stack two performances as good as Boyd Gaines' and Laura Benanti’s against a megawatt superstar like Patti LuPone, but it all comes off here effortlessly. Amazingly good even where you think it shouldn’t be. Too bad it’s closing early this winter, so if you haven’t seen it, you’d best hurry before your chance is gone. 5. Sunday in the Park with George by Stephen Sondheim and James Lapine at Studio 54, New York, 3/08. I know this opened in 2007 but it was new to me this Spring. A beautiful and very well-sung production to remind us all that it doesn’t require John Doyle to make excellent revivals of Sondheim works. 6. The Little Dog Laughed at the Kirk Douglas Theater, Culver City, 11/08. Douglas Carter Beane’s tart Hollywood farce arrived in Los Angeles largely intact from Broadway, including the hysterical Julie White in a performance so brilliant it’s almost too easy to dismiss it in this very funny play. 7. Bloody, Bloody, Andrew Jackson by Alex Timbers and Michael Friedman at the Kirk Douglas Theater, Culver City, 1/08. 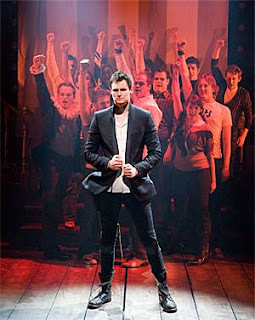 A wildly ambitious if flawed musical about the image and life of Andrew Jackson. What it lacked in consistency it nearly compensated for in sheer inventiveness and design smarts. 8. Assasins by Stephen Sondheim and John Weidman from the West Coast Ensemble at the El Centro Theater, Los Angeles, 8/08. 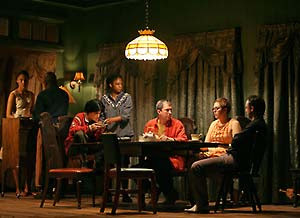 Less is more in this very successful musical revival over the summer in Hollywood. See number 5. 9. Speech and Debate at The Blank Theater, Hollywood, 9/08. Stephen Karam’s very funny take on teen angst fared very well at the Blank due to a number of factors including Mae Whitman's wonderful performance. 10. Shakespeare's Macbeth at the Lyceum Theater, Broadway, 5/08. Another great British import with a sharp look and a bloody, great performance from Kate Fleetwood and Patrick Stewart. Honorable mention: John Guare’s The House of Blue Leaves at the newly renovated Mark Taper Forum, The Wooster Group’s production of Hamlet at REDCAT, Jason Grote's 1001 at the Boston Court Theater, Alan Ayckbourn’s Taking Steps at South Coast Repertory, Donald Margulies’ Sight Unseen at The Old Globe Theater in San Diego, Marc Camoletti's Boeing-Boeing on Broadway, and the National Theater of Scotland’s production of Euripides' The Bacchae at the Lincoln Center Festival. Biggest regret: I twice failed to see the Old Globe’s production of All’s Well That Ends Well due to unforeseen complications. Some things are just not meant to be.